This is run against a 1-2-1-1 or 1-3-1 press. 5 inbounds to 1, who dribbles up-court until pressured (the ball handler must be a credible threat to bring the ball over centre). 3 and 4 are in the front-court corners, stretching the defense. 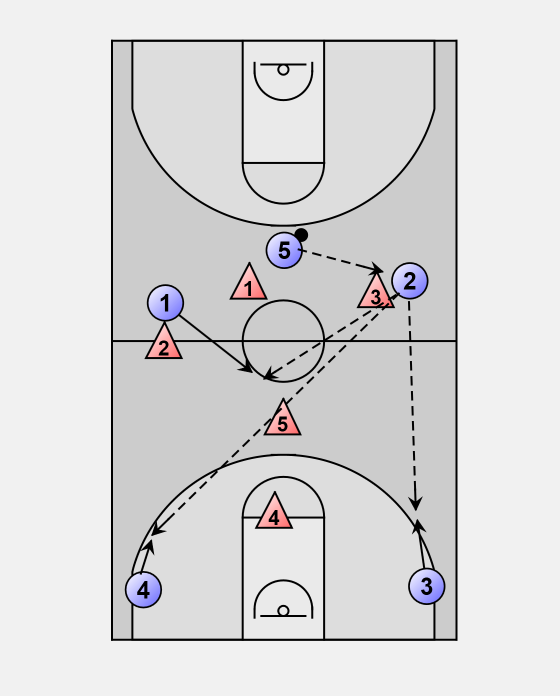 The following sequences show how to get an additional attacker (5, 2 or 1) positioned in the middle of the front-court. 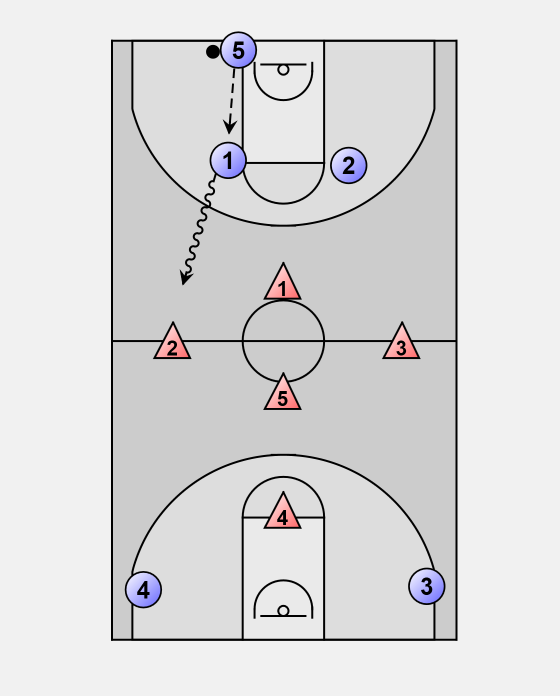 One option after the inbounds pass is for 5 to run up-court to a high post position. 1 and 2 are then responsible for getting the ball across centre. 1 could pass up-court to 3, 4 or 5, or reverse to 2.
that having only two attackers in the back-court may provide better alignment in the gaps of the zone, which has 3 defenders across the top. Alternatively 5 stays in the back-court as a trailer. 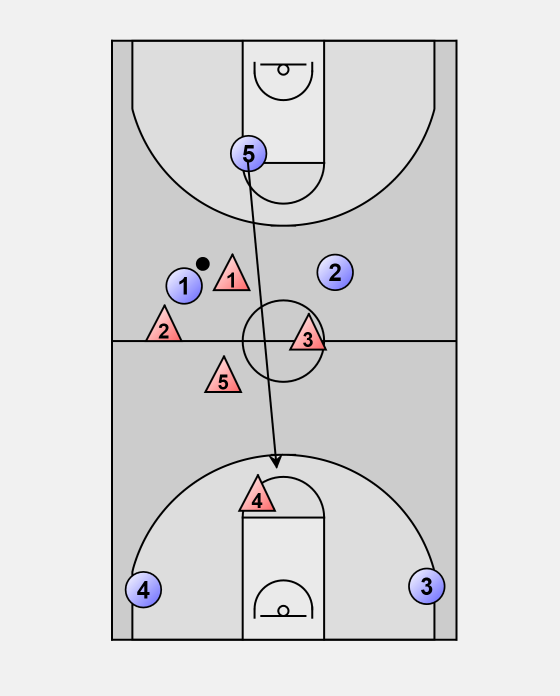 1 has the option of passing to 3 or 4 (who come to the ball), or reversing to 5. 2 could cut into the middle if it is open, or if the pass to 5 is denied. 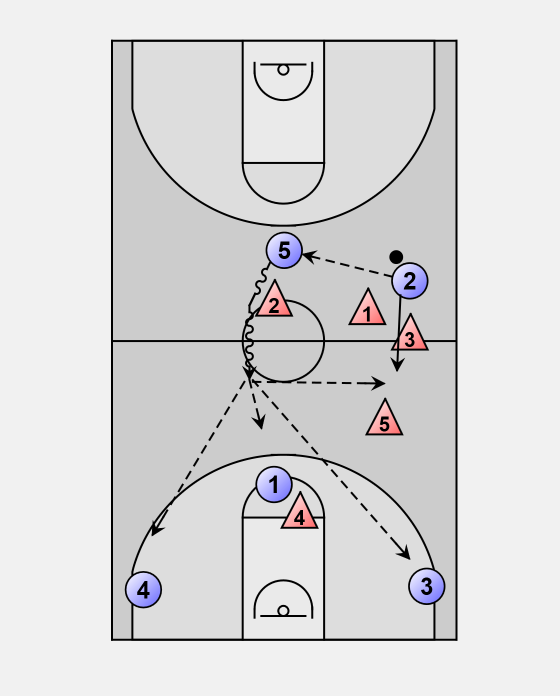 Here 5 reverses to 2, who can pass to 3 or 4 or 1 cutting up the middle. 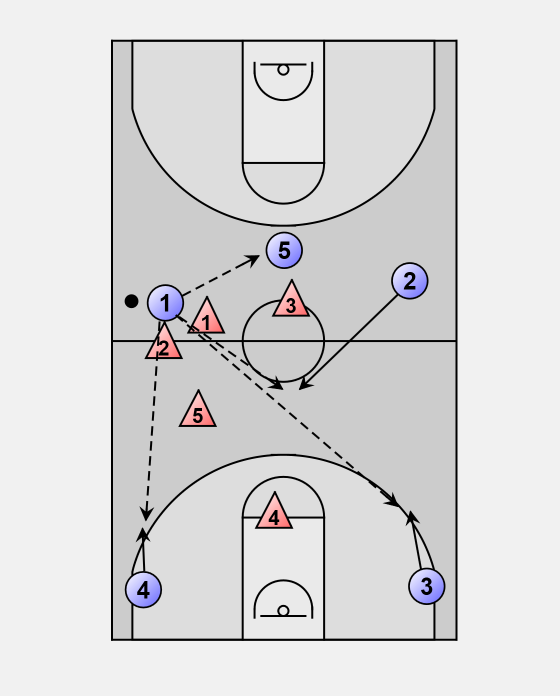 Or 2 can pass back to 5, who can dribble across mid-court then pass to 3 or 4 in the corners, to 1 at the high post, or to 2 breaking up the sideline. The earlier cut by 1 is intended to draw one or more defenders away from centre court.